Nepal is a landlocked South Asian country that lies between the Himalayan Peaks and the plains of India. It is known for snow-capped peaks and unique mountainous species of flora and fauna. All foreigners, except Indians, require an entry visa for visiting Nepal. Foreigners can get a visa on arrival at the international airport. You also can get visas at the Nepal embassy or from consulates in advance. You can get multiple entry visas by paying USD 20 at the Kathmandu Central Immigration Office. You do not need an air ticket or return air ticket to obtain a visa. Overstay charges will be USD 3 per day for less than 30 days overstay and an additional USD 2 as an extension fee. It is better to use a visa for 90 days from the very beginning. Nepal has restrictions on many items. Travelers can bring up to 50 grams of gold, 500 grams of silver, 1 liter of alcohol, 1 mobile phone and food weighing up to 7 kilograms. No contraband goods like guns or drugs can be brought into the country. We bought tickets for Nepal Airlines from Bangalore to Kathmandu. When we checked in at the airport, the counter staff informed us about the special meal facilities onboard, and some of our friends asked for special vegetarian dishes. The airline was very accommodating and treated us well. I would like to fly again to Nepal and I’m thinking of booking a ticket for the next holiday trip! We have been living in Dubai and wanted to spend our vacation with family at Nepal, so we booked a ticket. While browsing for an air ticket, I found that FlyDubai Airlines offered the best connectivity services to Nepal and hence booked the air ticket immediately. The flight was neat, safe, comfortable, and economical, so paying for the ticket was definitely worth it. We had a delightful time visiting various historical destinations. The people of Nepal were always courteous. Since we had round trip tickets, on the return journey, ticket re-confirmation was quite easy. I considered flying to Nepal on China Southern Airlines from Melbourne to Kathmandu, as it offered the most reasonably priced ticket. After a perfect landing in Katmandu, I met my tour group for Humanitourism. We all went to witness the five-day Tihar festival that involved both humans and animals. I had an amazing Humanitourism experience in Nepal. Since I had a return air ticket, it was quite easy for me to manage my ticket re-confirmation. My travel agent took care of my ticket re-confirmation for the return journey. It was a cherishing Nepal trip. Q. What are the major places of tourist interest in Nepal? A. Nepal offers a variety of tourist destinations. The Boudhanath stupa in Kathmandu is an interesting piece of ancient artwork. The Chitwan Jungle Safari is a major tourist attraction that lets you experience a vast, sprawling National Park, with amazing wildlife photography hotspots. For trekking enthusiasts, the Annapurna massif is the perfect mountaineering site. The view is fantastic and offers a gratifying experience. Q. What is the best season to visit Nepal? A. The best season to visit Nepal is at the end of September and mid-December. During this time Nepal looks gorgeous with lush greenery and beautiful clear skies. The next best time to visit Nepal is during the months of February until April. Usually around this period, the Boudhanath Buddhist temple in Kathmandu celebrates the Tibetan New Year with a huge festival. Book your air ticket in advance, and make use of the offseason air ticket benefits! Q. 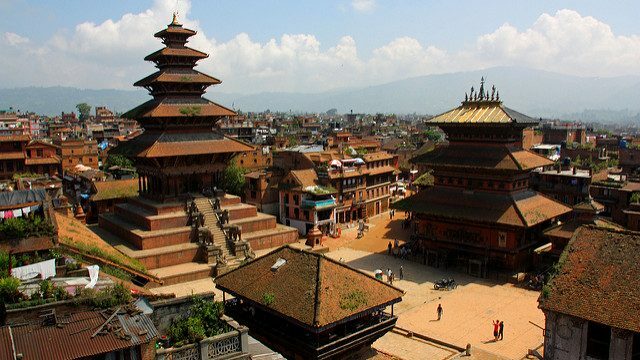 How can I be respectful to Nepal culture? A. The “namaste” posture is a widely recognized noble welcome gesture in Nepal. Additionally, be conscious of your eating habits. Do not offer food that you have taken a bite out of to someone else. Even if you are drinking water from someone else’s bottle, do not let your lips touch the mouth of the bottle. When eating with your hands, consider using your right hand only. People in Nepal have a conservative policy for clothing. Men are expected to wear shirts and full trousers in public places or shorts when trekking. Women should wear saris or long skirts with shoulder-covered tops. Airports handling direct flights to Tribhuvan International Airport ・ Indira Gandhi International Airport (Delhi) ・ Kuala-Lumpur International Airport (Kuala-Lumpur) ・ Dubai International Airport (Dubai) ・ Incheon International Airport (Seoul-Incheon) ・ Singapore Changi Airport (Singapore) etc. Tribhuvan International Airport is the only international airport in Nepal. There are very few direct flights to Nepal. Most passengers from Europe, Australia, North America and South America require a transit route, mainly in the Middle East or Asia. Alternatively, you can purchase budget air tickets and fly to Nepal via India. Nepal has 30 international routes from Tribhuvan International Airport. Some of the important international routes from Nepal are Delhi, India, Bangladesh, Hong Kong, Dubai, Abu Dhabi, Singapore and more.